Knowing Eternity is television documentary series composed of 13 half hour episodes, which aired on Vision TV in the fall of 2002. 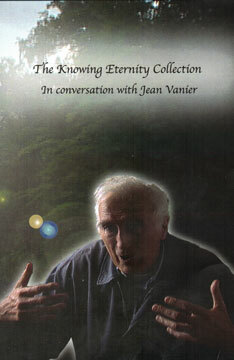 The series features renowned humanitarian, Jean Vanier, founder of the worldwide L'Arche communities for the mentally disabled, commenting on the gospel of John, a primary source of inspiration for his life of giving. The events described in the Gospel of John are ground zero for what we, the inheritors of Western culture, have become. We hope to restore some of the original impact of that foundational experience and to examine its timeless capacity to liberate us and to open us to possibilities for growth, both as individuals and as a society. Knowing Eternity is not a history lesson or a theological dissertation, but an examination of the most profound religious assumptions that have helped shape Western civilization and Western thought and sensibility. By providing a sort of contemporary inventory of the influence the gospels have had on our culture and way of life in the past and, in Vanier's view, ought still to have in the present, the series is designed to discover where and how we misplaced our sense of the sacred. Each show features Jean in interview format speaking off-camera to associate producer, Susan Morgan. The setting is the serene Augustinian Monastery in King City, ON. In this program Jean discusses the nature of John's Gospel with its emphasis not on the historical Jesus, but on the contemporary Jesus - the one whose words and deeds introduce us to a new reality, the reality of things unseen; to a world and a life that is more than it appears. It will stress the contemporary and mystical relevance of John's Gospel. John the Baptist proclaims Jesus the Messiah but this program is broader than John. We look at the whole Jewish tradition as a preparation for the authentic life proclaimed by Christ. These were Jesus' first words to his first disciples in John's Gospel. Not only is this a pressing personal question for all of us, it is one that relates particularly to Jesus since he was not the kind of Messiah anyone was looking for. This program tells the story of the miracle of changing water into wine. Jean considers it instructive that Jesus' first miracle was a small domestic one, not directed toward spectacular cures or the conversion of anyone, but rather to increasing human enjoyment. 5. Is Our World But a Marketplace? The driving of the moneychangers from the temple is seen by Jean as not so much an attack on the capitalist enterprise as on our tendency to focus on the trivial at the expense of the sacred and the holy. This program will examine this pursuit of false gold. In the Gospel of John, the pursuit of power is linked to the search for certitude - for final solutions to many things that constitute an obstacle, a reaction that grows out of fear. It is this struggle for power and certainty - sometimes called "hubris" or "pride" - that keeps us from the humility and the sense of wonder and trust in God needed for true discipleship. According to Jean, the Passionate Thirst expressed by Jesus in the Gospel of John is for an authentic life, a life in which we seek to become a source of life for others, refusing to become locked up in our inner worlds of selfish cares, disappointments and fears. In the Gospel of John, Jesus seeks out those who suffer from despair because they have been cast aside by their families and by society into an asylum for the sick and the insane. This feeling of rejection, leading to despair, is one Jean believes we all suffer from at different times in our lives. In talking about the meaning and symbolism of these miracles, Jean uncovers the gospel's emphasis on the importance of community and on the impossibility of a purely individual quest for spiritual perfection. In this show, Jean discusses the story of the woman who was caught in the act of adultery and sentenced to be stoned to death by the Pharisees. In effect, Jesus reacts to this situation by reminding the Pharisees that none of us are blameless, that we are all always "on trial" and in need of forgiveness for the sins we commit both against ourselves and against others. In the shows preceding this one, Jean discusses how John's Gospel teaches us that communion and forgiveness can help awaken the sense of the sacred that exists within each one of us. This cultivation of the spirit, through communion and forgiveness, liberates us to truly live the life for which we were intended by revealing the true nature and meaning of a life well lived. The Crucifixion, and therefore the judgment of the Gospel, is that humans do not want to see the truth, to accept Jesus into our lives as a sign of forgiveness and hope. Jean examines the story of the blind beggar near the Temple of Jerusalem, to whom Jesus restores sight and who is then persecuted by the Pharisees for his willingness to proclaim Jesus the Son of God. As we mature, if we discover in our lives what is essential, true and sacred, we will become shepherds for the young, the weak and the troubled among us. They will turn to us as sources of life and wisdom. We live at a time when we find few models close to home, so we invest celebrities with the qualities that we think will make our lives significant. © Copyright Norflicks Productions Ltd.. All Rights Reserved.